What do you think of this App-Enabled Robotic Ball? 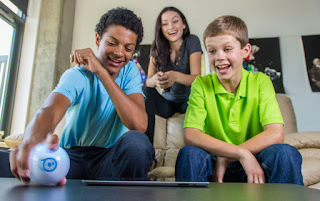 Meet Sphero - the app-enabled ball that does it all. Create obstacle courses, turn your living room into a video game with augmented reality apps, and upgrade family game night with multiplayer fun. Take crash courses in programming with free SPRK lessons and discover limitless possibilities through Connected Play. Control Sphero from your smartphone or tablet, change colors, complete challenges, earn tricks, and more. The more you play with Sphero, the better it gets. This virtually unstoppable companion is waterproof, pet-proof, and ready for any adventure. It’s time to upgrade your play!